The other day I was in a hurry to get out the door, yet needed to look put together for the busy day ahead. Because this scenario occurs frequently, I decided to pull up my iPhone timer and put together a five-minute routine to leave the house fresh-face and ready to take on the day. Prime your Pout. Lipstick is a wonderfully quick way to brighten up your face, but looks terrible on dry or chapped lips. Thus I start with a moisturizing balm, that will work it’s magic while I attend to the rest of my look. Even Skin Tone. Next step is to neutralize your skin tone by applying light-weight foundation or tinted-moisturizer. Since time is of the essence, make sure and use a multi-use coverage product that addresses any sun protection and moisturizing needs at the same time. Follow-up with a liquid concealer to cover any blemishes, as well evening out eyelids and dark circles. I know I’ve mentioned it before, but I’m a total fan-girl of these blending sponges for achieving a flawless face. Lash Love. A quick curl of the lashes always wakes up the eyes, finished with a few swipes of your favorite mascara. Being fair featured, mascara is a must for me to look polished. For those of you with naturally luscious lashes, and quick eyelash curl should do the trick. Bronze Baby. Nothing brightens up a face like a sun-kissed glow. Armed with your favorite blush brush, practice your best fish-face and follow the lines of your check bones. Then lightly highlight both sides of your nose for definition, followed by a quick sweep of the forehead and chin. Finish with a light facial spray to keep things looking fresh. Lip Service. As a final step, hit those freshly moisturized lips with some color. In my younger days I used to skip this step for a neutral gloss, but as I reached my mid-thirties, when motherhood and aging began to take its toll on my youthful glow, I realized that a nice lip tint gave my face a more vibrant vibe. 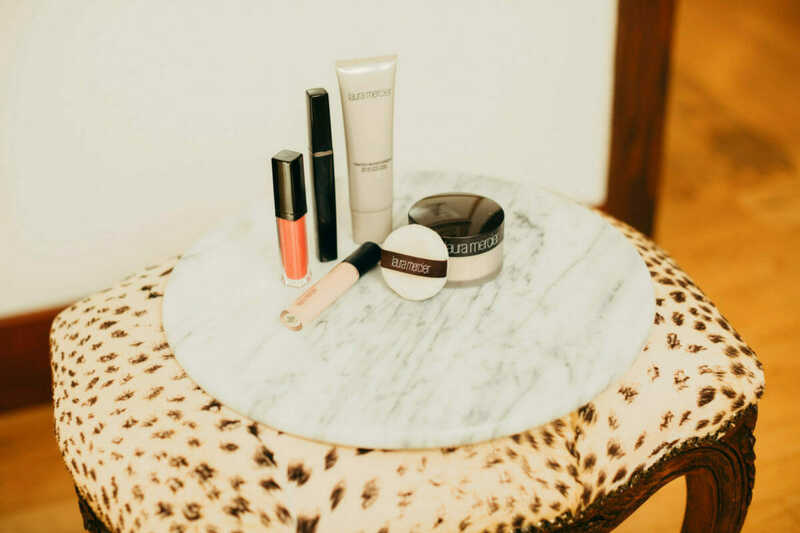 Once you nail down your simplified items, be sure to separate out the products together in a small organizer in your drawer and keep the apart from your full collection on makeup. I didn’t do this for years and just recently shifted to the 5 mins items together vs. in with other like items and it’s really helped me with lowering decision time and fumbling for my favorite items when I’m in a hurry. Check out this small lucite organizer that’s working well for me, but you can keep them in a small gift box, jar or what ever works best for your space. I’d love to hear from other busy ladies; what are your favorite hardworking beauty products for a quick, yet polished look?